I spent the day at home. Took a day of vacation from the 9 to 5. I sat on the deck in the heat most of the time. I would come in and cool off and get something to drink occasionally. Crazy. Yes. I know. Southeast Texas in July is hot and humid. Sweltering is a good word to describe the heat. I needed to be outside. I have been battling the abyss some this summer. Sitting outside detoxes my mind and spirit. I spent some time reviewing my resource notes. I like to use my birthday to reflect and assess my situation. I am pleased at what I found when sitting and listening to my own thoughts. I am not as down as I thought I was. I have had a few days of aggravation at the 9 to 5 and in dealing with some things at church. The frustration was at my own performance and attitude rather than other people. I complain about others when it is really myself with whom I am angry. I think I have let go of the irritation and I am already feeling better about things. There was a special set of events today that had a profound effect on my well-being. I got to enjoy the gazebo he put together for me. Our son called and we had a great visit. Our daughter called and we had a great visit. Our daughter-in-law called and we had a great visit. Another great thing for my birthday-I had an iPod that had become like an IV for my soul. I had my music with me any time I was not at the 9 to 5. Then, I broke it. I have had a difficult time since. I stopped walking at the track. I feel down more than usual. I was simply crushed without being able to listen to Dean Martin or Martin Denny whenever I wanted. But, he presented a small package to me last evening. A new iPod!! I am so grateful! Now I have to figure out how to make it work again. Our daughter advised me on what to do. I want to wait until I have a clear head to fool with it. But, I have hope for music again. I did not realize how critical music is for me until I had it at will then lost it. I found another gift today. As I was sitting outside, I noticed a tell-tale purple petal on the ground near the porch. The banana tree has baby bananas! Year before last, we ate a couple from our tree that produced late in the season. They were very small. They had a pleasant and less sweet taste than the store-bought variety. These have developed in time to perhaps have a full hand of them to eat later this summer. Our daughter had sent books and movies from my Pinterest wish board earlier this month. A card and perfect gift from him. Calls from my beloved children. Time at home feeling Texas summer to my bones. No cake or candles. No happy birthday song. None needed. Happy Birthday number 51 to me! Thank you to the family for making it wonderful. Thank you to Him for making it wonderful. Thank you to him for being wonderful. I love East Texas summers. I really do. No sarcasm. I love the warm, moist air. I love the steaming, hot air. I will sit outside in the shade during the hottest part of the day just feeling the heat and the dampness. I love tropical plants, too. 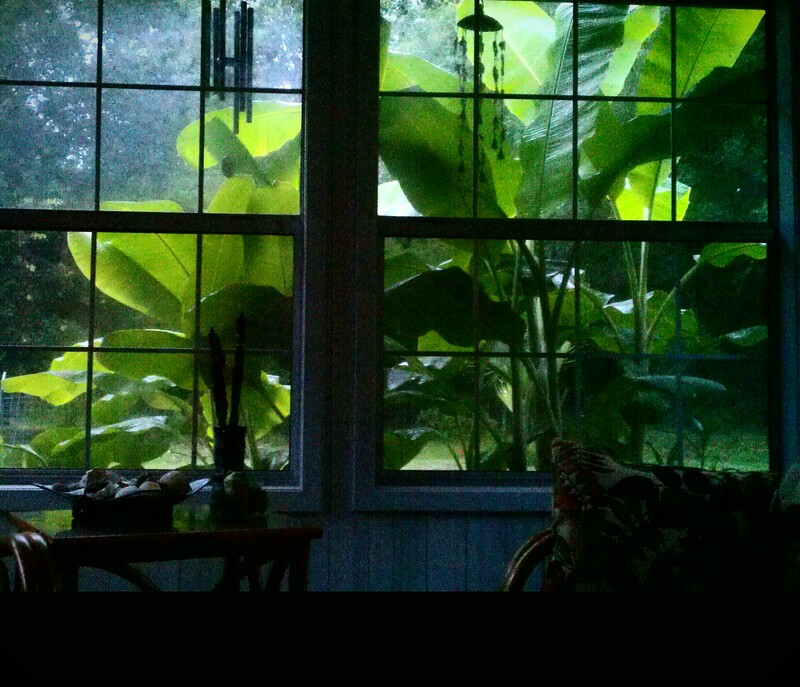 I have a banana patch outside the porch windows. I love looking at the huge bright green leaves. Cannas, or flags as I grew up calling them, are one of my favorite flowers. Many varieties of brightly hued flowers atop large leaves with different colors to choose from with them as well. Green, maroon, purple, variegated. I am trying to get a collection going. As I sit here this Monday morning, the light is gently growing and illuminating my banana trees. I could sit here all day listening to the birdsong and gazing out the window. Sometimes……I do.